It was a rough ride to the coal city. My team and the leader of the IPOB Elders' Council in Igwuocha had left later than we expected. We arrived late, though safely – thanks be to God – and settled down. Our brother, Amos, was worried about our safety, but heaved a sigh of relief when he heard that I was safe. The next day, the 11th of January, would be a deciding factor on the leadership of every tribe under Biafra. Yes, the programme was titled “HANDSHAKE ACROSS THE NIGER”, but we had all left our various comfort zones to prove to our Yoruba compatriots that Ohaneze was just a name and not a recognised body representing the Igbo people. Amos, being a master strategist, stood at a precise location in Enugu (Holy Ghost Roundabout) to welcome elders from various parts of Biafraland. Banners were given to these elders and on these banners were inscriptions about our missing leader, Mazi Nnamdi Kanu. Amos and I spent quality time that night discussing the best method to adopt the following day. The directive bearing the direction to the event centre was not clear, yet we got there. As children of light we allowed our light brighten up every darkness until we found ourselves at THE BASE EVENT CENTRE, home to the so-called unity event. We sat outside, some of us had not slept for even an hour, for the hotel we put into was a far cry from what we presumed. Clinton Ihunwo (Leader of Igwuocha IPOB Elders) Legborsi Emmanuel (the Ogoni activist) and others Joined me in a hotel that made us weep like kids. Even so, BIAFRA remained our focus. The event started with the introduction of delegates from the various parts of Biafraland and across the Niger (the West). The hall ruptured with shouts of joy when Femi Fani-Kayode's name was announced by the compere (what you call MC). Each delegate took his time to narrate the history of a united West and East, a mixture of truth and falsehood; a clear case of politics in the guise of unity. We all knew the West had come with a mindset of courting those across the Niger, since the North had failed to carry them along in the scheme of things. We cannot be deceived. The quiet meeting took a different note when Chief Nnia John Nwodo boycotted the Python Dance II experience, our missing leader to talk about the same restructuring that Buhari (or whoever or whatever bears that name now) had shelved in his New Year broadcast. The women, most of whom had lost their beloved children to the September military invasion codenamed PYTHON DANCE II, screamed out a rejection of restructuring. The hall lost its tranquility. Every woman, Biafran veteran, young boy and girl was not happy with Nnia Nwodo. I sat where our entire Veterans and bereaved family were. Yes, I had to be with them because they needed some morale boost. I also noticed that Somto Okonkwo was there to do his job. I went with the media wing of my team to ensure that this event was covered. Our veterans and women made the hall uncomfortable for the visitors from the West. It dawned on them that Chief Nwodo was not the leader of the people, his Red Cap and “ofor” notwithstanding. 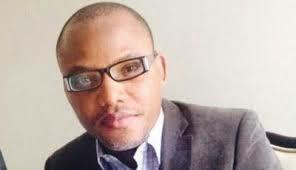 Nnamdi Kanu is another saviour. I was forced to grant two interviews First, I had a session with our BVI family who were there to cover the event. I told them that the unity Ohaneze sought was more political than real, since it was not a fallout from interaction with the people in BIAFRA. I also made it clear that a unity that resembles that of Nigeria’s is bound to lead us back to where we are. Yes, I agreed that the West are always welcome to discuss with us, but I said they should fight for their own freedom and leave us to fight for ours. We can become diplomatic allies. Any attempt to unite with us in the name of politics will be rejected. I was quickly cornered by men of the Nigerian Police and military personnel who had enjoyed my interview session. We went behind the event centre and discussed a lot. Yes, something very big is coming. That is all I can say. I am grateful to Jehovah Nissi, Elohim for all He has done. The absence of all the governors from the East shows that they know that the meeting is a sham. The absentee governors know the truth about our region. The Governor of Rivers State neither came nor sent a representative. Is that not a sign of rejection? What can we do without Rivers State, the real BIAFRA component? Bayelsa State Governor neither came nor sent a representative. Who is Ohaneze trying to fool? Who made them leaders? Nonsense! I want to congratulate our BIAFRA Veterans from Bayelsa who found their way down to the event. God will bless you all for not disappointing those that contributed their hard-earned money to make your trip possible. Thanks to the women, youths, and elders from Igwuocha. You made me proud yesterday. Thanks to my leader, Amos, for carrying out everything you were instructed to do by the invisible one. You are doing your best to ensure that he is not missed too much. Thanks to Elder Clinton Ihunwo and his brother for that libation. Saboteurs like Nwodo will remain cursed. Thanks to Legborsi Emmanuel, my Ogoni activist, for always availing yourself in this struggle. Thanks to the women and veterans for shaming Ohaneze. I will release pictures much later. We arrived very late last night. Thanks be to my Father in Heaven. This is the second trip in less than a week. There will be more. Pray for us all. Thanks to all of you that contributed in one way or the other to make this great movement a success. May God bless you all. Let me end by saying that the IPOB structure in Enugu must be pulled down. They did not attend this event. They failed to do their job. This is totally unacceptable! I also noticed that most of the noisemakers on facebook did not turn up. This is a year for work, work, and work. It is not a year to hide behind your phone. The National Coordinator of IPOB should wake up. He is asleep in a struggle like this. This is wrong. State coordinators failed to do their job because the national head was comatose. I am not happy with what I saw. God will help us.